First, though, here’s a quick look at what we’ve done so far – and a glance at what’s coming next. Keep in mind that this is a targeted timeline, but dates may shift slightly in content development. If that happens, we’ll let you know. For all our fans out there dying to head back to the bayou, we’ve got more paid story content coming your way. 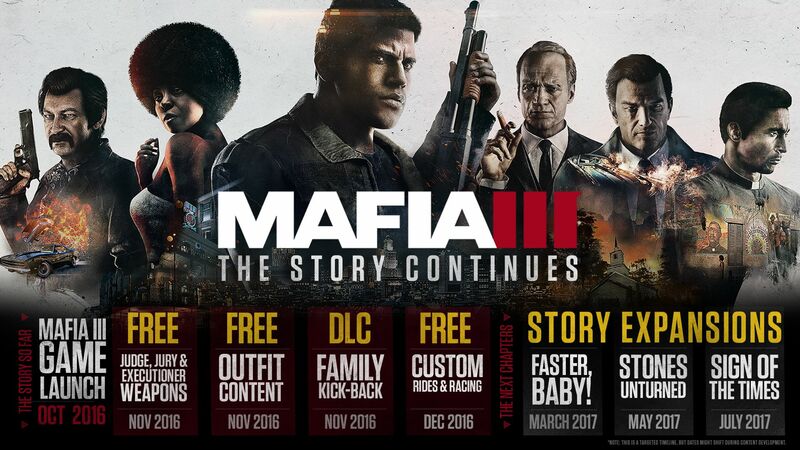 This is what your Season Pass covers – three major paid expansions delivering the next chapters in the Mafia III crime drama, plus more locations, action and rewards to Mafia III. Ever since the team wrapped production for the game’s launch, we’ve been hard at work expanding the world of New Bordeaux. So, with that, here’s what you can look forward to in 2017. As we said above, keep in mind that precise dates may shift. All three of these story expansions will deliver tight, focused, and compelling narratives, while also introducing new gameplay mechanics, activities, environments and rewards. Harms: “We were really humbled by the response to the characters and the story in Mafia III, so we wanted to double-down on that as much as possible, while also providing players with different gameplay experiences. Mafia III focuses on the systematic destruction of Sal Marcano's empire, racket-by-racket, while all of the expansions tell direct, linear stories." We’re introducing you to a whole new part of New Bordeaux you’ve never seen before. This story expansion features intense action, highlighted by thrilling stunt driving and high octane car chases in the bayou! In the coming weeks, we’ll be revealing much more on “Faster, Baby!” including its incredible new environment, strong female lead, new gameplay mechanics and activities, and of course, the DLC story expansion’s power-crazed antagonist. Follow us on Facebook, Twitter, and YouTube to get the news right as it hits.